The Scotch Malt Whisky Society (SMWS) has revealed 10 new single cask whiskies to celebrate two major whisky festivals, Spirit of Speyside and Fèis Ìle, to be released next month. The members club is marking the two biggest whisky festivals in Scotland with a series of events held at Spirit of Speyside (3-7 May) and Fèis Ìle (25 May - 2 June), as well as the release of 10 bottlings. ‘The Speyside and Islay whisky festivals are key dates in the whisky calendar, with May seeing the annual pilgrimage to the renowned whisky festivals,’ said Helen Stewart, senior brand manager for the Scotch Malt Whisky Society. Two Speyside single cask single malts will be released next month: 9.143 ‘Graceful Gravitas’, 60.6% abv 21-year-old from Glen Grant that falls into the ‘sweet, fruity and mellow’ flavour profile (£95), and 107.13 ‘Andalusian Gazpacho’ a 65% abv nine-year-old malt from GlenAllachie distillery said to have ‘a big Sherry influence’ (£55). Both whiskies will only be available to buy online in the UK and EU. 3.308 ‘A Maritime Meander’, 13-year-old Bowmore; 57.4% abv. 53.248 ‘Slapped By Poseidon’s Glove’, 11-year-old Caol Ila; 58.0% abv. 53.252 ‘Smoky Incarnations’, 11-year-old Caol Ila; 57.8 % abv. A Maritime Meander, Slapped By Poseidon’s Glove and Smoky Incarnations will only be available to purchase during Fèis Ìle and at SMWS member’s rooms. Weaving Wondrous Dreams will also only be available during the festival, as just 222 bottles have been produced. The remaining whiskies will be available to buy online in the UK and EU, while all festival bottlings will be available by the dram at the Society's partner bars. 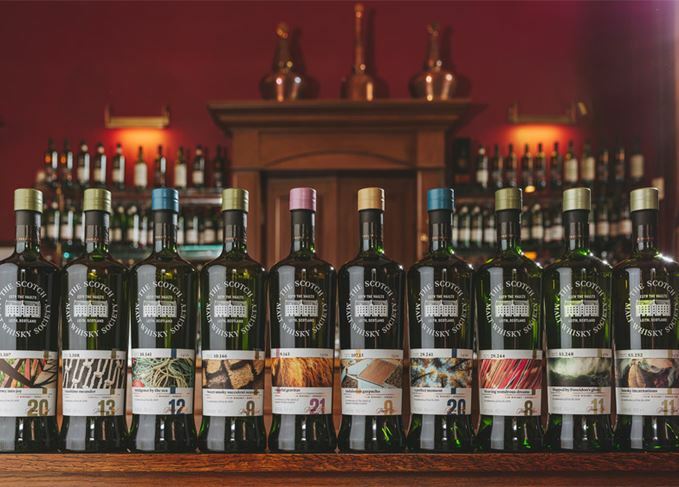 The SMWS will be holding a series of events at both festivals featuring ‘special celebratory bottles’, alongside ‘Islay versus Speyside’ tastings at member’s rooms and partner bars during the month of May.